Our approach to Diabetes and Hypertension management utilises lifestyle modifications that encourage positive, effective and definite changes in diet and physical exercise. The major goal in treating diabetes is controlling elevated blood sugar without causing abnormally low levels of blood sugar. After assessing and understanding the patient’s food preferences and blood parameters, a diet plan is tailor-made for the individual by our medical nutritionist.This includes co-ordinating the patient’s meals with their medication. Individuals are encouraged to incorporate easy-to-follow exercises and physical activity into their daily routines as regular physical activity improves your body’s response to insulin and lowers your blood sugar level. The diabetes management and treatment plan is adjusted as needed. Individuals are encouraged to incorporate easy-to-follow exercises and physical activity into their daily routines as regular physical activity improves your body’s response to insulin and lowers your blood sugar level. We will also adjust your diabetes management & treatment plan as needed. We encourage family lifestyle and health education and self-management. The estimate of the actual number of diabetics in India is around 40 million. This means that India actually has the highest number of diabetics of any one country in the entire world. Diabetes is a metabolic disorder where in human body does not produce or properly uses insulin, a hormone that is required to convert sugar, starches, and other food into energy. Diabetes Mellitus is characterized by constant high levels of blood glucose (sugar). Diabetes mellitus can be controlled to a great extent. So, you need to have complete information to manage it successfully. The control of diabetes mostly depends on the patient and it is his/her responsibility to take care of the diet, exercise and medication. Advances in diabetes research have led to better ways of controlling diabetes and treating its complications. But more importantly keeping your blood sugar level within your target range can help you live a long &healthy life with diabetes. Obesity and diabetes are linked so much so that the word ‘Diabesity’ has been coined. If diabetic, by losing weight one can become less insulin resistant thereby being able to control diabetes. Education, after all you should know what makes your blood sugar level rise or fall thus leading to an effective prevention. Behavioral modification, motivational interviewing, patient empowerment. Co-ordination of your meals and medication-too little/too much food in comparison to your medication may cause your blood sugar level to go a dangerously low/high level respectively. 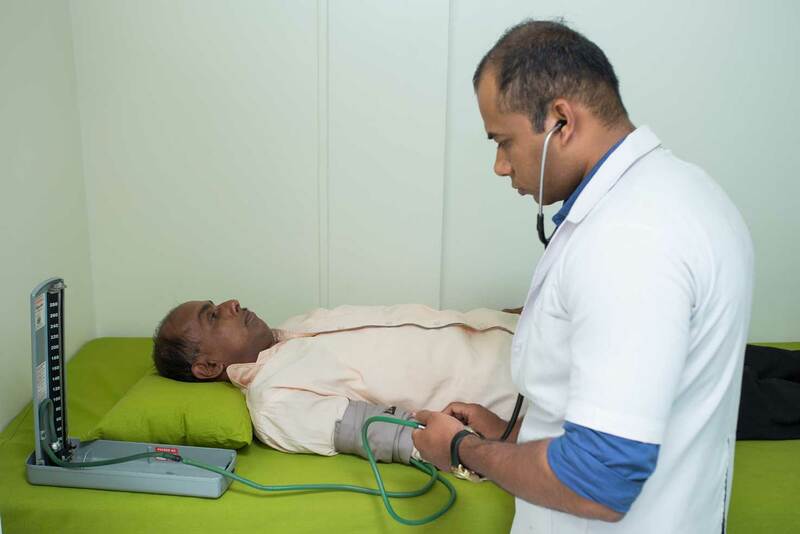 These changes are initiated only after assessing and understanding the individual’s food preferences, his blood parameters and are tailor-made for the individual by our medical nutritionist. PHYSICAL ACTIVITY – When you exercise your muscles use sugar (glucose) for energy & regular physical activity improves your body’s response to insulin & therefore lowers your blood sugar level. Individuals are encouraged to mould their daily routines into a medium level of physical activity. MEDICATION – Insulin and other diabetic medications are designed to lower your blood sugar levels and are effective if taken at the appropriate time and dose, as guided by your physician. BEHAVIOUR MODIFICATION – This envelopes a methodology that is used to adopt and encourage positive, effective and definite changes in diet and level of physical activity. Constant guidance will be given to manage blood sugar level in illness,stress, fluctuating hormonal levels, alcohol intake etc. Blood pressure is summarised by two measurements, systolic and diastolic. Normal blood pressure at rest is within the range of 100–140mmHg systolic (top reading) and 60–90mmHg diastolic (bottom reading). High blood pressure is said to be present if it is often at or above 140/90 mmHg. Hypertension is classified as either primary (essential) hypertension or secondary hypertension; about 90–95% of cases are categorized as “primary hypertension” which means high blood pressure with no obvious underlying medical cause.1 The remaining 5–10% of cases (secondary hypertension) are caused by other conditions that affect the kidneys, arteries, heart or endocrine system. Hypertension puts strain on the heart, leading to hypertensive heart disease and coronary artery disease if not treated. Hypertension is also a major risk factor for stroke, aneurysms of the arteries (e.g. aortic aneurysm), peripheral arterial disease and is a cause of chronic kidney disease. A moderately high arterial blood pressure is associated with a shortened life expectancy while mild elevation is not.